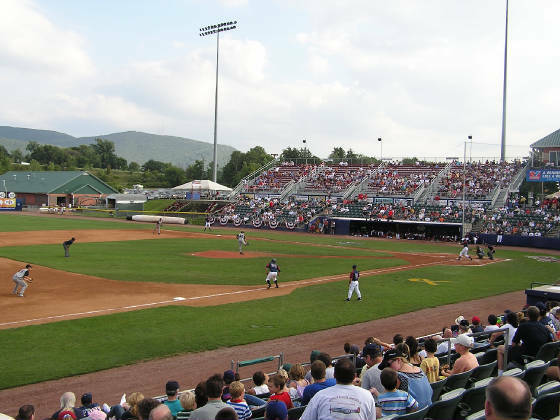 DUTCHESS STADIUM IN FISHKILL NY, HOME OF THE HUDSON VALLEY RENEGADES HAS HOSTED THE NY - PENN LEAGUE TEAM SINCE 1994, SINCE IT WAS BUILT IT LOOKS LIKE NOTHING HAS BEEN DONE WITH THE PLACE! 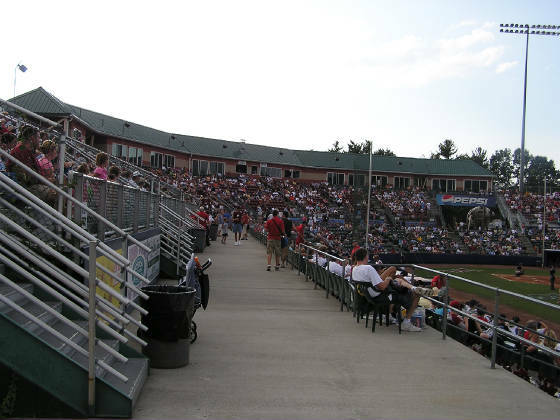 HOWEVER, YOU MAY NOT NOTICE ANY OF THAT BECAUSE WHAT THE RENEGADES HAVE MANAGED TO DO IS SELL THE PLACE OUT NIGHTLY, MAKING A TICKET TO DUTCHESS STADIUM A VERY TOUGH ITEM. 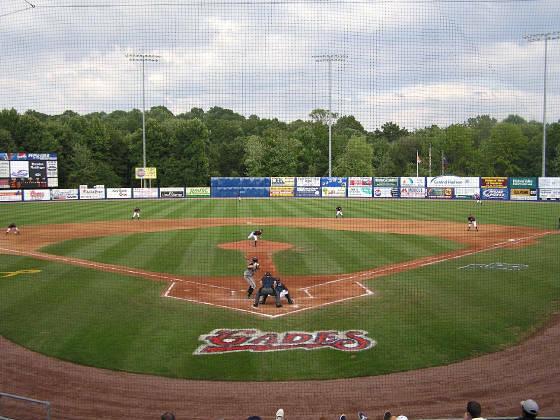 WHEN PLANNING A TRIP TO DUTCHESS STADIUM THE FIRST THING TO DO IS PLAN EARLY AND CALL THE RENEGADES. 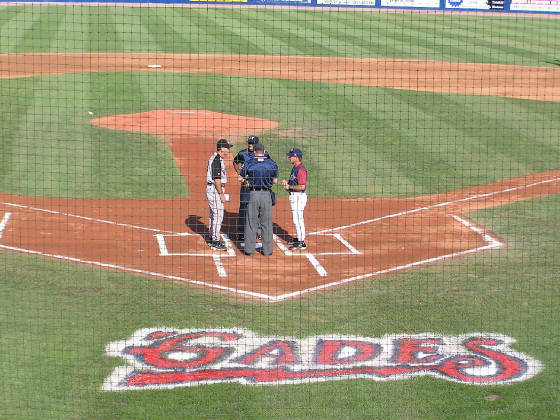 THE RENEGADES ALSO HAVE A GOOD WEB SITE TO PURCHASE TICKETS, THE SEATS DESIRED CAN BE CHOSEN RIGHT ON LINE, BIG FAN OF THAT FEATURE! ONCE A TICKET IS SECURED, NOTICE THE GAME TIME, SUNDAYS ARE @ 5:15 AND WEEKNIGHTS ARE 7:15, BUT LEAVE EXTRA TIME TO GET TO THE PARK DUE TO THE SINGLE LANE APPROACH AND THE AWFUL PARKING LOT. AFTER WAITING SINGLE FILE IN TRAFFIC, THE RENEGADES GREET YOU WITH A $4 PARKING FEE (THE WEB SITE STATED $5 BUT I PARKED FARTHER AWAY AND WAS ONLY CHARGED $4). $4 TO PARK ISN'T EVEN CHARGED AT SOME TRIPLE A PARKS!! AND THOSE LOTS ARE PAVED! ALSO, BECAUSE THE CLOSER SPOTS ARE TAKEN BY SEASON TICKET HOLDERS, A LONG WALK THROUGH A DUSTY PARKING LOT IS IN STORE. 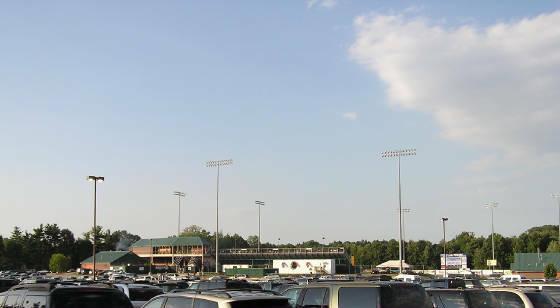 ONCE INSIDE THE STADIUM, A SOUVENIR STORE IS SITUATED TO THE LEFT OF THE ENTRANCE, HOWEVER, THERE IS A GOOD CHANCE THAT SHORT WALK WILL BE A LONG ONE BECAUSE THERE IS GENERALLY A LOT OF CLUTTER AROUND THE ENTRANCE. 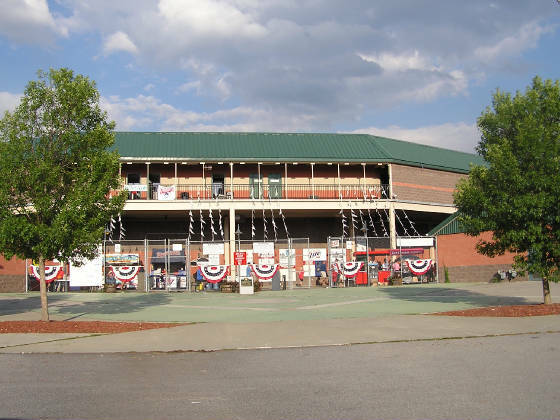 THE RENEGADES ARE BIG ON PROMOTIONS, AND THE BIG BOXES WILL BE 4 DEEP WHEN YOU ARRIVE AS WELL AS THE 4 OR 5 CONCESSION STANDS THAT SIT DIRECTLY ACROSS FROM THE ENTRANCE. ONCE INTO THE SEATING AREA, DUTCHESS STADIUM'S FIRST VIEW IS THE FIELD WHICH NEVER DISAPPOINTS. ALWAYS A THICK DARK GREEN FIELD, WITH A LANDSCAPED 'HV' DOWN THE RIGHT FIELD SIDE AND BUSHES AND SHRUBS DOWN THE RIGHT FIELD SIDE JUST BEYOND THE END OF THE STANDS. 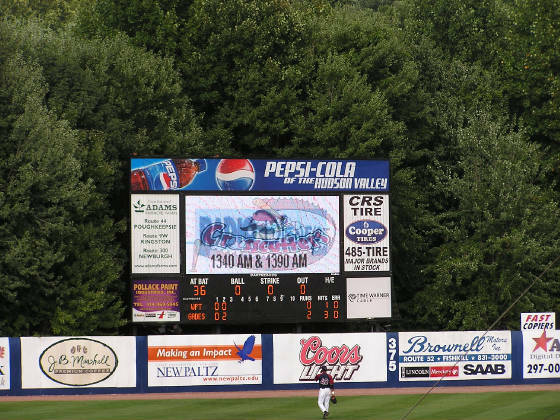 BEYOND THE OUTFIELD WALL, NOTHING BUT TREES WHICH GIVE THE PLACE A REAL 'PARK' FEEL TO IT. 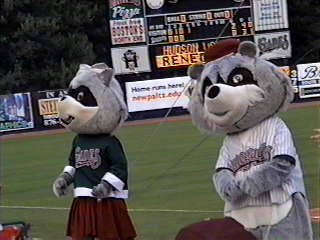 THE GAME HERE HOWEVER, ALWAYS SEEMS SECONDARY TO ALL OF THE PROMOTIONS THAT ARE RUN BY THE RENEGADES. AND THE RENEGADES SEEM TO KNOW THAT KIDS ARE THE RASON MANY FAMILIES COME OUT, THE RENEGADES NEVER SEEM TO DISAPPOINT THEM EITHER. 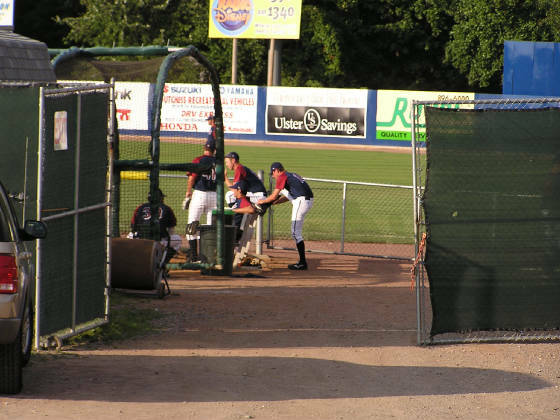 WITH MANY BETWEEN INNING PROMOTIONS, WHICH ARE STANDARD THROUGHOUT THE MINOR LEAGUES, TO THE NOT SO STANDARD "STOMP YOUR FEET AS LOUD AS YOU CAN" ON THE METAL BLEACHERS TO INSPIRE A RALLY. THE P.A. ANNOUNCER IS ALSO PART OF THE STADIUM WITH COMMENTS MADE DURING THE GAME, MANY OF WHICH ARE PRETTY FUNNY. I WONDER IF THAT IS BECAUSE I ONLY HEAR THEM ONCE OR TWICE A YEAR? 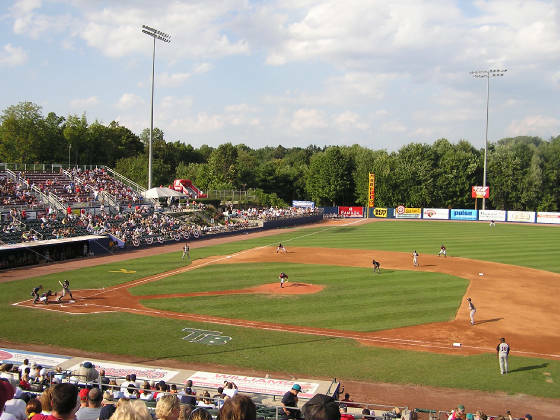 DUTCHESS STADIUM IS AN OK PLACE TO SEE A GAME. A BETTER PLACE IF YOU ARE A FAMILY, NOT SO GOOD IF YOU ARE THERE JUST FOR THE GAME. THE WORST PART OF MY LAST TRIP WAS IT APPEARED THAT THERE WAS A LOT OF NEGLECT GOING ON HERE. THE TOP 5 ROWS OF THE BLEACHERS WERE INFESTED WITH BEES MAKING IT A HORRIBLE NIGHT AT THE PARK. THE PARKING LOT IS NOT PAVED AND FOR THE MOST PART, THE PLACE WAS DIRTY. 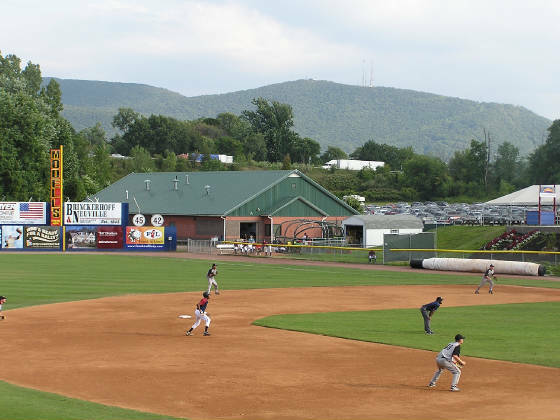 STATE COLLEGE, PA WAS LOOKING FOR A NY-PENN LEAGUE TEAM LAST YEAR AND IT SEEMED THE RENEGADES MAY HAVE BEEN A CANDIADTE, THAT COULD HAVE LED THE TOWN OF FISHKILL TO IGNORE THE STADIUM. 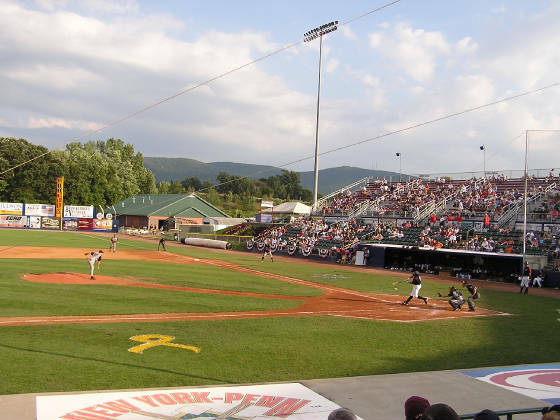 THE RENEGADES ARE TOO GOOD A FRANCHISE TO LET GET AWAY BUT IT JUST MAY HAPPEN IF SOMEBODY IN FISHKILL DOESN'T START TO PAY ATTENTION TO THE PARK. 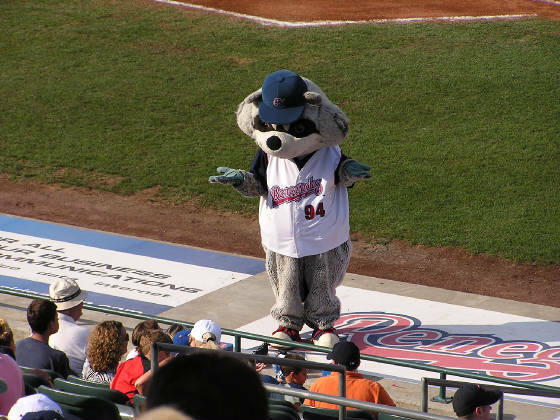 IT WOULD BE A SHAME TO SEE ROOKIE, RENE, AND RASCAL UP THERE WITH NOBODY TO ENTERTAIN ON A JULY EVENING.